New Ultimate Flora™ Probiotic Fizzy Drink Mix is available in 2 delicious flavors with a choice of 10 or 15 billion live probiotic cultures per serving. “Our Ultimate Flora Probiotic Fizzy Drink Mix answers the need for adults who have difficulty swallowing capsules, or for those who simply appreciate a great-tasting new way to support digestive and immune health,”* stated Bonnie Cooper, Renew Life Vice President of Marketing. 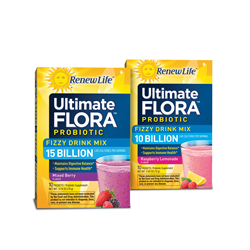 For additional information about Renew Life Ultimate Flora Probiotic Fizzy Drink Mix, please contact Bcooper(at)renewlife(dot)com. These products are not intended to diagnose, treat, cure or promote any disease.